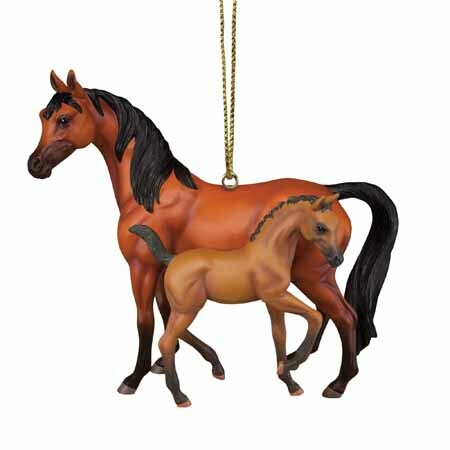 Stand By Me | Pony Ornaments Figurines | One Price Low Flat Shipping! From the Trail of Painted Ponies Winter 2016 Everyday Ornaments Collection, Stand By Me Mother and Foal Hanging Ornament. Made of stone resin. Measures 2.5" tall. Designed by Trail of Painted Ponies art department. Seen here is a mother and foal, with the little one seeking comfort. Akin to Ben E. King's lyrics for his famous hit song, the sentiment depicted a child saying to his loving parent, "take care of me." Comes with ready to hang cord attached and is packaged in Trail of Painted Ponies gift box.